Note: Bridget Kenny's mother, Sheila Kenny, shared this paper that Bridget wrote for a college course, and for which she received an "A." The paper tenderly blends delicious themes of family, cornbread, Cornbread Supper, and cooking. With Bridget's permission, we share here with Cornbread Nation. For this paper, I decided to interview one of my favorite cooks, my mama, for one of my favorite recipes, her special cornbread. My mother and I both share a common love for food, especially home cooked meals that carry certain comfort and reliability. Cornbread is absolutely delicious, as well as traditionally prepared in homes all across the southern region of the United States. A big reason I think it is probably traditionally associated with the South is because of how cheap the ingredients are, and how most recipes provide large servings. When I return to Kentucky from school, I am always eager to arrive home and sit down at the dinner table to feast on the deliciousness of my mama’s cornbread. Both of us share a love of spicy food, and tend to gravitate towards carbohydrates that are more savory than sweet. When I was much younger, my little brother and I were both extremely picky eaters, and that presented a challenge to my mother on what to feed us at dinnertime. It is sort of a running joke within my family that until I was about twelve or thirteen years old, my diet consisted mainly of pinto beans, corn, white rice, or plain baked potatoes. I think of that often when my mama serves corn bread now, because it is something I loved to eat when I was a finicky eater, and it has stood the test of time to be something I still enjoy eating today. I had always enjoyed eating my mama’s cornbread, but had never really put much thought into the actual food itself or where she had learned to make it. After our interview, I gained a more in depth view of her cornbread, and what it represented. My mother got the recipe for this particular corn bread from a good friend of hers, Rona Roberts. She tried it at a party called “Cornbread Suppers” that the Roberts host every Monday night in their home in Lexington, Kentucky. The idea of the Cornbread Supper event is to have a drop-in style potluck dinner with close friends and family, who are all welcome to bring a dish, or stop by empty handed to sample others foods and visit with loved ones. My mom said it was the best corn bread she had ever tasted, and immediately asked for the recipe. “Best I have ever had and of course, like most great cooks, she had made up this recipe.... luckily for me, she is a generous soul who was very happy to share it”. I thought this was a very interesting way for my mom to begin making her cherished corn bread dish, and I liked imagining how it had been made up spontaneously, passed from Rona to my mom, and then set upon my dinner table for me to enjoy. I think one of the things that connect us, as a culture is food, and the passing of recipes, not only among families or within cookbooks, but also in the more casual ways of lending a recipe to a friend, or experimenting with ingredients to concoct one’s own version of a recipe. Mama continued to relate to me how she enjoys making cornbread using the “well seasoned, nine inch cast iron skillet “that belonged to my step-father’s mother, Kentucky native Mary Jane Bowne. Even though Mary Jane died before my mom and step-dad ever got married, she said she feels very connected to her late mother in law whenever she makes her cornbread in the old black skillet. My mom was rather particular in describing her rituals when preparing the cornbread, noting that she always uses a particular wooden mixing spoon (something I instantly visualized because I have used the exact spoon countless times growing up helping her in the kitchen). She is also mindful of her ingredients. “I always try to use stone ground, unbolted, white cornmeal from the Weisenberger Mill that is located in Midway, Kentucky, just outside of Lexington. I used to pass this mill every day, taking you and Brody to daycare and just seeing the packaging reminds me of those wonderful days and driving beautiful country back roads!” I had no idea that my mother used a specific cornmeal to make her delicious bread, and it enhanced my feeling of connection to her recipe because I still love driving the old country roads to Midway and passing the hills and horses that make up the farms surrounding my hometown. I think part of the reason her cornbread is so good to begin with is because she uses this fresh stone ground local cornmeal. Cornbread is a pretty simple recipe, but using choice ingredients makes it a much more appealing dish. This aspect of her recipe reminded me of how location is key in food ways and it’s link to cultures. By supporting a local mill, my mom has directly linked her preparation of cornbread to the city she lives in, and to the memories of driving my younger brother Brody and I to school. This did provide a slight problem when I attempted to duplicate her recipe in Tuscaloosa however, because I was unable to acquire the same cornmeal and had to settle for a Publix version instead. As I attempted to duplicate my mother’s recipe, I found it to be relatively easy, and kind of similar to baking a cake. I opted to add in a few red pepper flakes, just as mom does, but decided not to worry about cheese. I also did not have a cast iron skillet at my house on campus, so I had to settle for a plain aluminum one. This did not affect the taste, although I’m not sure my finished product was quite as good as my mama usually makes. For one thing, she typically serves it with delicious chili, and I was the only one home when I made the cornbread, so I didn’t get the same effect of setting the skillet down on the table to enjoy with friends at a meal. Also, the recipe calls for the mixture to sit for 24 hours prior to being baked, and I did not have enough time to mix it the day before. The recipe was rather relaxed, because it didn’t feature strict measurements or instructions, and had a wonderful experimental theme to it. 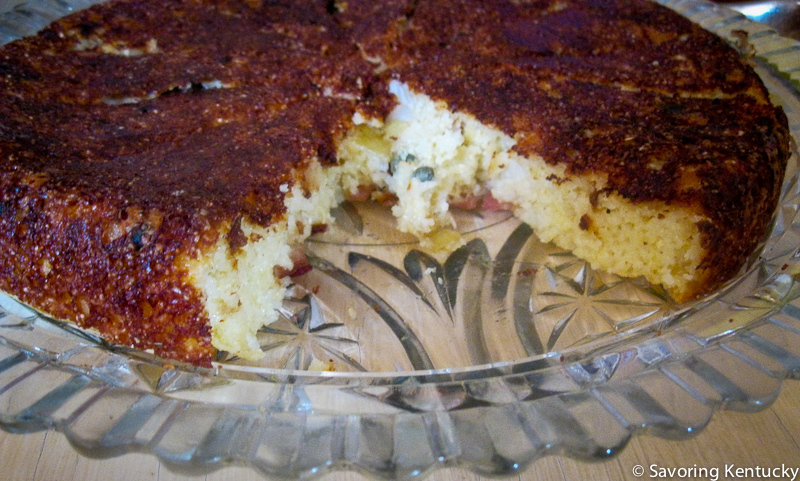 I felt proud that I was able to make mine with a crispy crust; something my mom prides her cornbread on as well. I did this by following her tip to preheat a couple teaspoons of olive oil before adding the batter, and being extremely attentive to the timer on my kitchen’s oven (I tend to burn things)! Both my mama and I love cornbread because of its comfort. “It is soul-food. It is home and country and an unpretentious, authentic and elegant…”, cornbread for my mom and I is not just another side dish but something that is a reminder of fond memories, good friendships, family ties, and southern roots. It makes my mom feel connected to the community in Lexington because she received the recipe from a treasured friend and uses cornmeal prepared at a local mill. It makes our family feel connected because she uses a deceased relative’s cast iron skillet, as well as the fact that she has been able to share what this recipe means to her and pass it on to her daughter. I think the identities that can be connected to food and specific recipes can be a huge part of why someone loves a certain dish. Often times it is not just the recipe itself, but who is making it, that makes a profound difference on the nostalgia and comfort a food can provide. Many people in the south eat cornbread, but there is none that makes me salivate or reflect as much as my mama’s special recipe.